Here’s something we haven’t discussed in a while: How do you handle your kids’ doctor appointments? Do you delegate them to a caregiver, such as a nanny, and have that person call you once he or she is in the doctor’s office? Do you “take turns” with this duty with your partner? Who schedules the appointments — or looks up symptoms — or calls the nurse with questions before or after appointments? Recently, I had a frustrating week that seemed filled with kid-related appointments that I couldn’t get out of. Kid #1 needed to be somewhere when Kid #2 needed to be picked up, and my husband was traveling, so I was on deck for Monday. On Tuesday, the husband was still traveling and the ophthalmologist’s office actually required a parent to be there. On Wednesday, Kid #1 got sick… the time in transit or in waiting rooms seemed interminable. 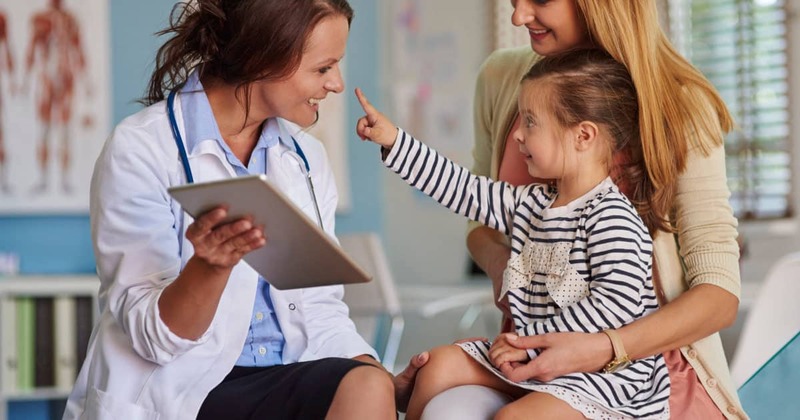 These visits are all tinged with very mixed feelings for me — I love to be able to talk with the doctor face to face and ask whatever questions pop up, including those based on my child’s behavior or symptoms at the appointment itself. But that said, I hate being at a totally inefficient doctor’s office where we end up sitting for 45 minutes in a germ-filled waiting room — and if I try to do what I presume is “the working mom thing” and ask to be put on speakerphone once the doctor actually shows up, I inevitably feel like a princessy helicopter mom who doesn’t trust whichever caregiver took the child. However… I tend to be the one who knows the most about whatever underlying condition we’re worried about (history, symptoms, etc.) and can ask the questions that will save us future trips, so it often has to be me, or at least it feels that way to me. What are your thoughts, ladies? How do you handle these appointments? Stock photo via Deposit Photos / gpointstudio. We don’t have very many routine appointments in the UK – 1 doctor visit at 6 weeks, vaccines at intervals and then the health visitors. The health visitor does development checks at regular intervals at home, about 5 or 6 in the first year and then one yearly or so. I did the ones while I was on mat leave and we’ve traded off vaccines since then. We’ve been lucky, we’ve only done an illness appointment twice and this was at the out of hours clinic so we were both able to go. I don’t think it’s helicopter-y to call in to appointments if a nanny or babysitter is taking the child in, only if it’s their father. That said, I’ve taken off for all my LO’s appointments so far because Mr Lana can’t drive. I can’t speak to Lana’s situation, but there was a period of 1.5 years where my husband suffered from a serious medical condition and was not able to drive. This was a very difficult time for our family as all of the errands that required driving, such as doctor’s appointments, daycare drop-off/pick-up, etc. fell to me. It’s a huge burden to be the only driving parent, whatever the reason, and I think that empathy rather than judgment is probably called for here.
? No idea about this poster’s spouse, but lots of people can’t drive for physical/health reasons (epilepsy, blindness, etc). We’re those dorky parents that like to both go to our child’s well-checks so we can ask the doctor questions. We’re lucky to both have jobs where popping out for an hour for an appointment is no big deal. That said, our pediatrics practice is great and I don’t think we’ve ever waited more than 10 minutes. Usually it’s 5 minutes max, even if we show up early. I’d be singing a very different tune if I had to wait 45 minutes at each visit. When she’s sick, whoever is staying home with her will take her, and that’s usually determined by whoever has less important work stuff that day. Same. We both try to go to all the doc. appts and we schedule them so that they fit around busy days/times. We’ve been lucky so far with DS1, who hasn’t gotten sick too often, especially now that he is a toddler. We’ll see how it is with baby getting older and having to coordinate two kids’ appointments. We’ll probably have to take turns as we won’t be able to both go to everything. We usually brainstorm some questions ahead of time together and have a list ready if we both can’t make it. Same. Although now that she’s older and doesn’t get sick too often, sometimes we both go when we can swing it. It’s partly because the first time I took her alone, she ended up having RSV and had chest X-rays and some other tests, and was nearly hospitalized. Hubby felt guilty he didn’t go, and it’s always stuck with us. But we have one kiddo, flexible jobs, and a great practice. I’m in the Midwest where most (obviously not all) have a somewhat more relaxed approach to childcare and jobs seem to be more flexible. It’s eye-opening to me that it’s not acceptable for at least one parent to take off work to go to a dr’s appointment in some places. Same, although we haven’t both made it to an appointment together in awhile due to travel or important meetings that one of us can’t get out of. I’ve done all of the sick visits, of which there’s only been a couple, but just by coincidence. My ped office is great, though, so I have no complaints. I’m glad to know we are not the only ones who both go to doctors appointments when possible! We do too! I like going because we’re taking LO to my childhood pediatrician and it’s super nostalgic for me, but my husband is with our baby more during the day and is the one who’s actually equipped to answer questions about her routine and what her poop is like and so on. When Kiddo was young and had frequent doctors’ appointments (both routine and sick), I often had our nanny take the kid to and from the appointment but met them there. Our pediatrician’s office runs pretty efficiently, and it took me about an hour round-trip to make the appointment. It was a nice middle ground between calling in and taking care of the whole thing. Now DH stays at home/works from home part time, so he’s way more flexible. Also, Kiddo is older (almost 4) and doesn’t have nearly as many appointments. I haven’t taken him to the doctor in years. Both DH and I go to doctor’s appointments (well-check and sick visits). DH is a SAHD, we have one kid, I work 15 minutes from the doctor’s office, and we see a family practice (so the doctors know all of us as both patients and parents). DH is not good at medical information, at all, so I prefer to be present to ask questions and get a clear diagnosis (I have been known to attend his non-routine doctor’s appointments with him from time to time as well as he has serious white coat syndrome as a patient). We rarely wait more than 10 minutes from our appointment time and they have a lot of early morning and late evening hours that make it work. The only time I will send my kid to the doctor with my husband is for a very straightforward sick visit (e.g., suspected ear infection, strep, tummy bug). For well-child visits, mysterious or serious illnesses, and all injuries, I take her myself. My husband doesn’t like to ask any questions or think critically about medical care, which drives me up the wall when he is the patient (Me: why exactly is the doctor recommending this surgery? what are the risks and benefits? what is the recovery like? what are the alternatives? what is the prep? Him: I don’t know. I didn’t ask. I just said okay.). His unquestioning acceptance of everything the doctor says is absolutely unacceptable to me when our kid is the patient. Or when it’s me–one of the main reasons I hired a doula was that I was afraid he’d pressure me to cave in to interventions I didn’t need or want, and I wanted someone in the room looking out for my interests. This is one of those things that I hate to say out loud because it sounds like such a classic “aren’t men helpless?” kind of stereotype, but +1000. My husband is a highly capable, amazing dad and he has the more flexible schedule but I won’t let him do Dr’s appointments alone. He turns into a total bozo. Like, comes home with a cream for a rash and no idea what the diagnosis is, how frequently we’re supposed to use the cream, when to stop using the cream, or signs and symptoms to look out for. The serious basics. My strategy for making these appointments more manageable is (1) we switched to a smaller office– no giant waiting room of snot-nosed kids, more predictable schedule, and (2) when possible, I get the first appointment of the day. This isn’t always possible of course for sick appointments, but it makes such a difference in terms of wait times. Basically same for us. Husband keeps her half the week and she goes to sitter 2 days. His schedule is very flexible and allows him to still being in significant income while caring for her. I try to go to all appointments. She was under the weather today and I made her a last minute appointment and he had to go alone. Ugh my typos are awful. Sorry, I’m sick too. My husband handles all of the well visits and dental appointments, with the exception of the first few baby “routine” visits which we alternated to spread the misery of baby vaccinations. He has much more PTO than I do, so that’s how we landed on that division of labor. I generally handle the sick appointments because we trust my clinical judgement and ability to not freak out more. I usually make the appointments and my husband takes the kids. He is a doctor and has a lot more questions than I do. When the kids were very small I would take them but in the last few years, it’s been all him. I generally handle all of it, and DH usually comes along for the ride. What’s annoying is that I have to email or text him for his available dates (bc if I just ask casually, at home, where we live together, he can’t give me dates. And this is rich, bc I live and die by a paper planner, so if I’m separated from it, and you asked me for an available date, I’d have to punt, too.) I’ve missed one or two well visits or sick visits, and it was totally fine, but I didn’t feel totally fine about it. I would not feel comfortable having MIL or FIL (part-time caregiver) handle an appointment unless it was an actual emergency. I am amazed by the short wait times you all describe. Our pediatrician and my OB/GYN are the only doctors we see who do not keep us waiting for a minimum of an hour every single visit. With my GP and any specialist, it’s a minimum of an hour in the waiting room after the scheduled appointment time and then often another 20 to 30 minutes waiting in the exam room. There aren’t that many specialty practices or female GPs around to choose from even though we are in a decently sized city, so the doctors have all the market power and can be as slow as they please. Yeah, specialists are very different. I assume most of the comments are about general pediatricians, not pediatric specialists, unless someone said otherwise. When we had a nanny, I loved having the nanny take kiddo and calling in or my husband calling in as needed. So efficient! We had a great nanny who I trusted for medical stuff, but for something like a well check, I wanted to be part of the conversation. Now, I work more flexibly and take the kids for their appointments (and for lunch/a snack after). My kids don’t remember anything else—we saw a van for a child transportation service in the pediatrician’s parking lot and my kid was perplexed that a parent wouldn’t be available/able to take a vacation day to take a kid the doctor. This all assumes a healthy child who occasionally gets sick. And if that’s your case, you’re very lucky. My oldest daughter had a serious condition that required multiple specialist visits as we dug into causes and treatment options. There was no way I could have sent a nanny to these appointments, nor would I have ever wanted to (also my husband also went to all these appointments). My career flexibility ground to a halt during this time–I had to stay in my job (that I had outgrown) because I had enough seniority to get the flexibility needed for these appointments. Thankfully my child is doing much better and the appointments have vastly decreased. And really, it’s an incredible privilege to have been in a position that afforded me this flexibility or to even have a nanny to go to medical appointments. I have to plug the Heal service. It’s an app that sends primary care docs to your home in a 2-hour window and we have used it several times for our DD when we suspected ear infection or similar run of the mill illness but not warranting a visit to the pedi. With our PPO insurance, it works out to $89/visit and counts toward our deductible. Paying out of pocket when we had an HMO was $99. That is well worth the ~$55 difference to me to not have to drive back and forth to the pedi and to avoid the sick waiting room. The only complaint I have is that now we are further from the city center, they often don’t have availability until two days out, which sort of defeats the purpose for a lot of things we were using it for. I have also used it for myself. If you’re in a city where it’s offered, I highly recommend it. For regular ped visits, I almost always end up taking whichever kiddo has the appt (when baby is older we’ll probably try to combine them), because DH can’t leave work during the day whereas I have a lot of flexibility. If he happens to be off that day or out early, though, he definitely takes them. We don’t usually both go except on rare occasions like a specialist visit, and neither of us has called in to an appointment. My husband is a SAHD, so he can take the kids each time without me, but my job is flexible enough that I usually tag along for visits that are planned ahead of time (check ups and the few times there’s been a follow up to something possibly (luckily never actually) troubling). I sometimes find myself thinking that a dad with a SAHM wife would almost never do that, but I don’t know, it’s nice to be able to go and see in person that things are OK and hold the kid when s/he has to get shots and whatnot. He handles the unplanned but routine ear infections/sore throats/etc. type things. I know several dads with SAHMs who endeavor to go to most of the doctor’s appointments. And my husband went to every appointment when I was on mat leave (which I know isn’t the same thing as SAHM, but still). I’m definitely the person who interacts with doctors in our family (as discussed above) and I think I can count on one hand the number of times he spoke in the doctor’s presence, but I was glad he was there and was listening to what the doctor said. This whole conversation is really blowing my mind…I’m a recent SAHM and it never occurred to my husband or me that we would both attend routine doctor appointments (other than during paternity leave). Is this an ingrained gender roles thing? An innate “caregiver” instinct in women? An attempt to be more egalitarian parents? I feel totally capable of dealing with the doctor and relaying the info to my husband, and it seems like a waste of his time to skip work… I don’t know – no judgment, I am just seriously surprised/interested by these answers! For me, I think it was more about trying to avoid ingrained gender roles. I’m the default planner/logistics person in my family, which is fine for the most part (DH does more of the day-to-day chores). But you’re always hearing about how women take on all the emotional labor, and I didn’t want our kids’ medical stuff to become my domain entirely. So I made it very clear from the moment I got pregnant with our first that DH was going to be involved in choosing a pediatrician, going to appointments, etc. I wanted to make clear to him that he should be involved, but also make it clear to our pediatrician that he was an equal parent, since you always hear about them defaulting to calling the mom or whatever. Fwiw, he was unenthusiastic about interviewing pediatricians (he felt it was unimportant and would rather I have just picked someone by word-of-mouth recommendation) but has been very eager to attend all doctors appointments once the baby arrived. They change so much in the first couple of years and as first time parents, both of us feel like we have no idea what we’re doing half the time, and being able to check-in with the doctor in person and get information and reassurance is comforting to us both. Neither of us work in Big Law-type jobs though. He doesn’t have a boss in the normal sense of the word, and I have a boss who doesn’t know or care if I leave the office for an hour here or there. We try to schedule appts for around lunch, and the whole thing usually takes less than an hour (even with getting a quick lunch afterwards as a family) so it’s really no different than taking a lunch hour. Has anyone tried telemedicine for children’s illnesses? My insurance provider just came and gave a presentation on it and made it sound like it would eliminate most of the need to bring a sick kid to the pediatrician’s office. 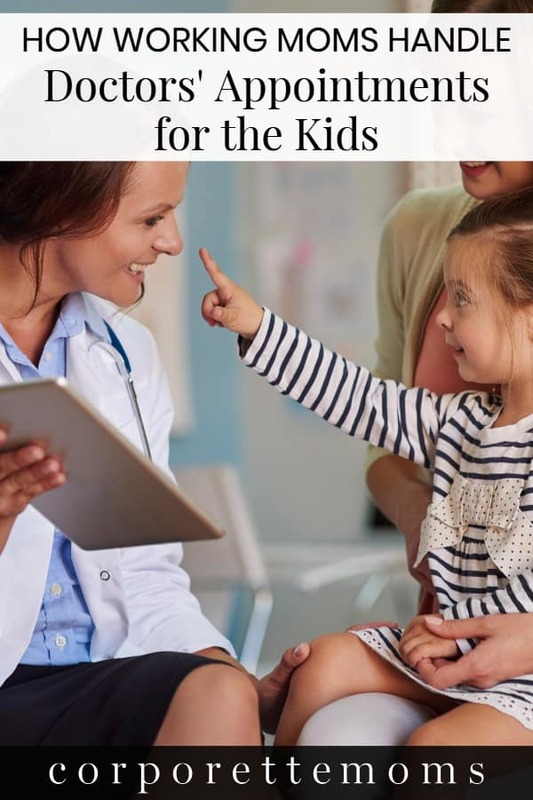 I think I’d use it in situations where you can basically self-diagnose…like if your kid gets frequent ear infections and you know all the signs and know that your kid just needs a script for antibiotics, then telemedicine can be useful. Anything more than that, I’d like to actually be seen. I’m sure insurance providers love it, but my pediatrician’s office is adamantly opposed and believes it undermines the standard of care. I know the ped’s office has something to gain by us going there instead, but I do think there’s something to be said for keeping all your care in one place. Seems like telemedicine is a good way for potentially serious issues to get overlooked. I won’t even use it for myself, let alone my kids. It really depends on the type of appointment. Routine illnesses? Whoever’s schedule is more flexible that day, goes. For specialists, I like both of us to be there for the first few appointments, and we alternate after that. Well-child checks? I’d rather handle it because IMHO, DH doesn’t ask enough questions. I handle all visits during the school year and try to schedule any well visits on my work at home days, when its easy to pop out for a bit. My husband does any that happen over the summer, when he’s off (high school teacher). Our pediatrician’s office is almost always on time, so its usually fairly quick.